I also went to Martha’s Vineyard for a weekend and it was really lovely. … Can you tell that I love flickr? Heh. For the past few weeks I, like so many other Greek diaspora, have been completely consumed by news of the wildfires there. Most of my family lives in the northern part of Greece—Macedonia and Chalkidiki—but I do have a cousin living in Kalamata, which was affected by the fires, and I have wonderful memories from a summer spent in the Peloponnese. It’s a starkly beautiful place and I’m heartbroken to think of the devastation that’s been wrought there and how many peoples’ lives have been ruined this past summer. The only silver lining in this entire disaster is that all of the ancient sites put at risk by the fire, such as Olympia and Mistras, managed to escape the blazes, in large part thanks to the absolutely devoted Greeks that wanted to protect these sacred sites at all costs. Next time I can, I’ll try to find my photos from my trip in the Peloponnese, as I’d visited many of the villages that have now been completely destroyed. Who knows how many years, if not decades, it will take for those areas to return to something resembling normal. On a brighter note about Greece, I was recently contacted by one of the co-organizers of JMusic.gr: “Where Greeks Turn Japanese.” These guys in Athens are doing what I’ve always wanted to do—throw a giant J-rock party. They’ve invited me to drop by next time I’m in Athens to hang out with them, and I definitely will. I’m excited as hell that there’s a healthy contingent of Greek J-rock fans, partying as only Greeks know how to the music that I love so much! Finally, I’m thinking of embarking on a little project that might excite a few Gackt fans. Back in October 2001, the Gman went to Madagascar to record a documentary for NHK (which is the PBS of Japan to put it simply). I think it was originally supposed to be a documentary about the country, with Gackt simply being the celebrity vehicle. Instead, it ended up being a really fascinating portrait of him as an artist in transition. He was on the cusp of big-time success at the time, and he himself said in an autobiography that he wasn’t really sure what was going to happen to him. That trip to Africa, for him, was at a very opportune moment musically and emotionally for him. Now, this documentary has never been subtitled in English, so most non-Japanese fans of his really have no idea what’s said in it. It’s a shame, as it’s probably the most interesting Gackt-related piece of media I’ve ever seen. So far removed from the celebrity trappings that generally define him in Eastern media, we, as you might expect, see him in a totally different, remarkably sincere way. I think I want to take it upon myself to subtitle this documentary so more fans can enjoy this piece of “Gackt history” as it were. When I really look back at my own life, I completely think that the trip to Madagascar was the second great turning point for me. At the same time, I was keenly feeling my own lack of strength. My existence felt very small. And so, I felt that I couldn’t be rescued by the people who were around me. That feeling hasn’t changed even now. What is the most necessary for people? I think that is the fact that people have to wake up and realize change is inevitable. For example, because we say Madagascar is a poor country, there are people who give 100,000,000 yen to their cause. One village can probably live affluently on that money for a year. However, after a year, conditions return to what they were previously. And so, there is no meaning in doing that. No one makes you bring food to your mouth to eat; if food is set before you, then you will pick up chopsticks and eat of your own will. That’s the same way I operate. I dine on my own intentions. The things which are seen to be moved by my intentions and purposes are, to people, the most precious things, the most important things. If that’s not the case, nothing will change about people. I want you to make me act on my intentions. I want you to change. I am not going to make anyone change of my own will. Though this was something that I had thought about many times before I went to Madagascar, going to Madagascar refined it, and I felt then that the things I was thinking about were definitely not a mistake. This snippet alone to me justifies trying to translate this documentary, I think. My Japanese is really not as good as it used to be, as I’m sorely out of practice, but I’ll keep you guys posted if I make any progress . 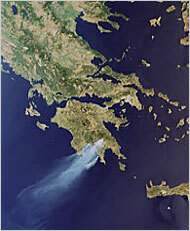 I’m really sorry about the wildfires in Greece. Though, it’s so nice to see J-Rock spreading all over the world. So, purple SKY has finally been shipped? I’ll have to drop by B&N later today. Even though I don’t really comment, I do enjoy reading your posts very much! Good luck with the translation! Hi, did you eventually did do the translation for the show? because I just came across the old episodes and felt the same way. Intrigued actually. Send me the links to the videos if you did upload! P.S ‘Jihaku’ is just added to my booklist :) Thanks for mentioning it too.